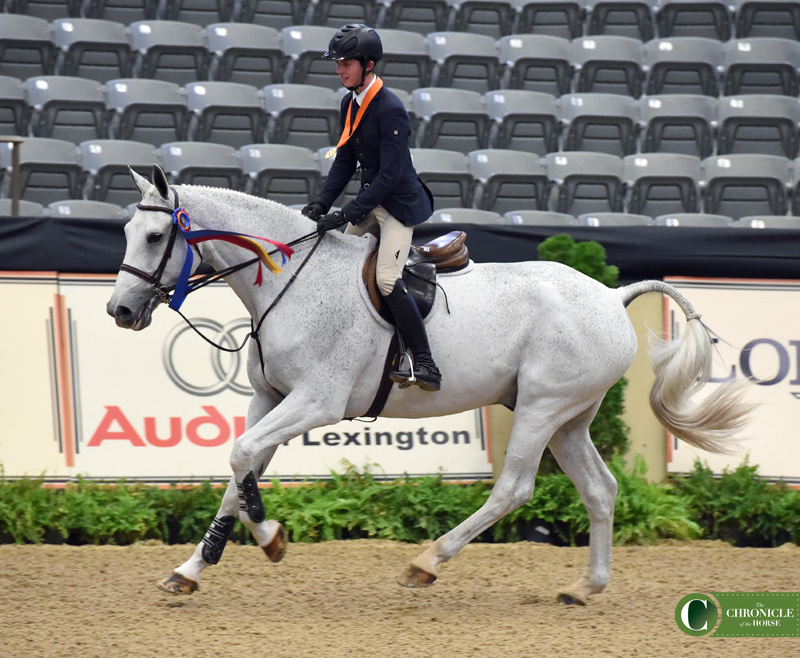 Your 2018 ASPCA Maclay Finals winner is Sam Walker! Check back later with COTH for the full story! There will be additional testing after the second course! 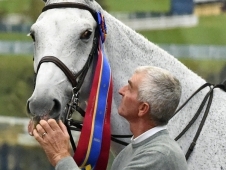 It was the judge’s call whether they wanted to pin the class after the second round or do additional testing and they opted for the latter–these six riders will come back in the ring to do a test called out by the announcer. They will test in this order: Mimi Gochman, Paige Matthies, Emma Kurtz, Brian Moggre, Coco Fath, and Sam Walker. The test is as follows: canter fence seven, canter fence two, counter canter fence six a, canter fence six b, canter fence four, halt. Return to order. 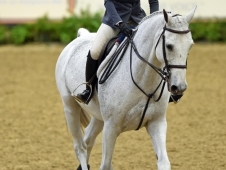 Mimi Gochman is up first- she canters out of the line up and curves back to the oxer, finds the white rail nice and forward, counter canters the in of the two stride split rail line and canters the out, halt nicely and returns to the line up. Paige Matthies up next. She finds the first two fences nicely and looks like she’s really trying to make up some ground. 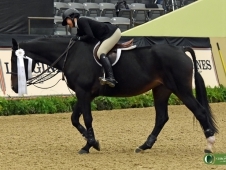 Emma Kurtz is up to bat now- she finds the first two fences very well but her horse does not want to do a flying change to the counter canter, and by the time she gets it done with a simple change there is basically one stride left to get to the split rail two stride, and she unfortunately hangs a leg and pulls it down. She and the horse both make it through it and finish the course appearing relatively unfazed, that’s a bummer because Kurtz was my pick to win it after her brilliant second round! Brian Moggre up now. He moved down after the second round to third. He gets and holds the counter canter well. The rest of his round is great, it will be interesting what the judges make of the rider’s test. Coco Fath starts up now. She finds the first fence well, finds the second fence well too, but her horse gets offended on the back side when she tries to steady for a lead change and halts and props. she continues on and finishes well. It looks to be Sam Walker’s class to win or lose- he finds the first fence well, slices the white rail beautifully, opts for a simple change to the counter lead and holds it through to the split rail two stride, has a great final fence and great halt. I’m not a betting woman, but I would guess Sam captured the win here. We will let you know shortly! 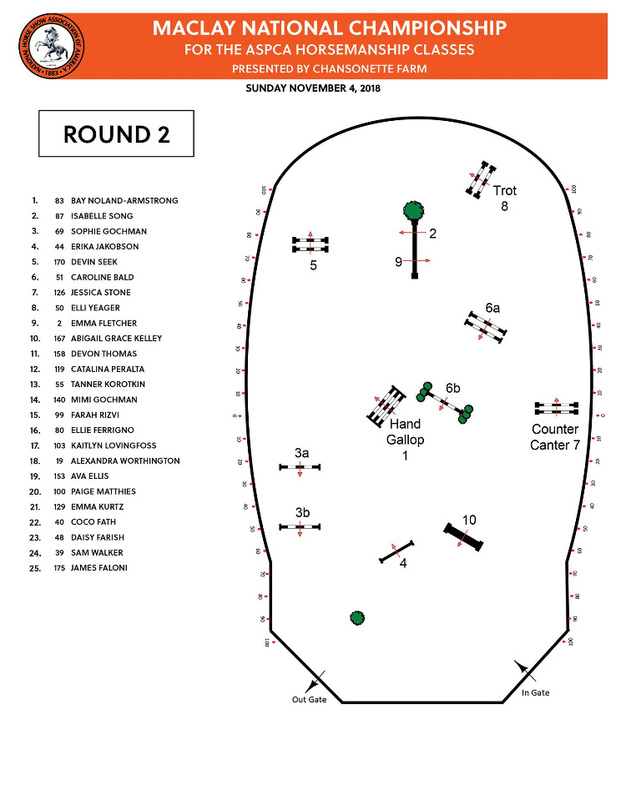 Riders will start by hand galloping to fence one, a triple bar composed of two brush boxes and a single back rail, set on the diagonal off the left lead. They then loop around the end of the arena and roll back to fence two, the 40-foot long racetrack rail and bend back to 3AB, a pair of the military style boxes with rails, set on the long side. Riders will then rollback to fence 4, an upright white gate set right out of the corner and do a long bending line to a white coop oxer with no wings. 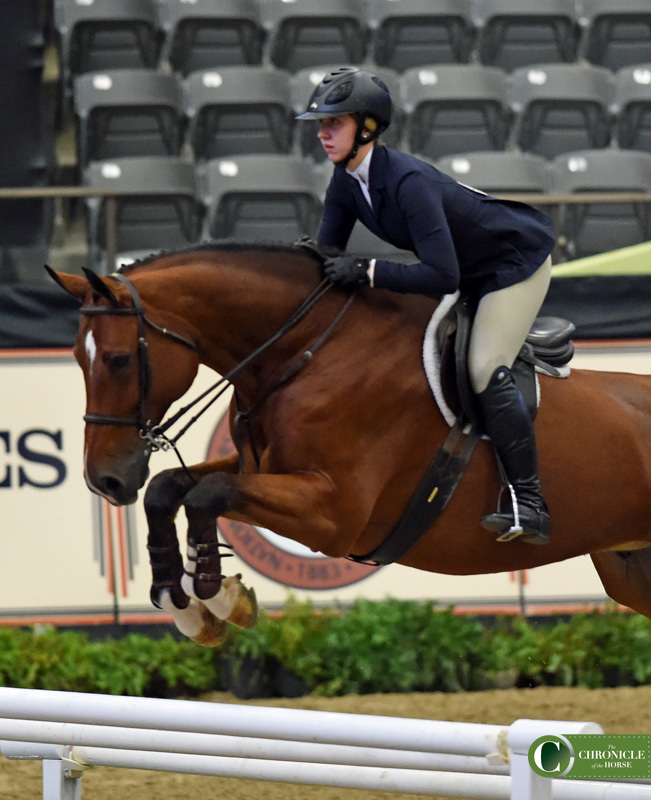 They’ll canter through the corner and jump the second combination on course, 6AB, composed of a skinny, airy, rustic oxer to a vertical. Next up is fence 7, a birch rail oxer with brush boxes underneath set along the long side. 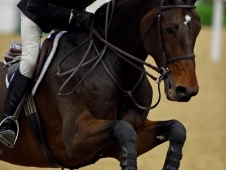 Riders are asked to counter canter jump 7. After that they’ll come back down to the trot for fence 8, a white rail oxer. They then loop back around the end to roll back on the race track rail again, this time in the opposite direction. They finish on a rustic gate oxer at fence 10. The order of go for the second round is in reverse order of preference. Bay Nolan-Armstrong is up first. She’s carrying a nice bold pace to fence one, steadies up for the plain white rails, gets a touch deep to the white vertical and pulls the top rail. This course is going to be all about straightness, because six of the obstacle have no standards to speak of. Bay takes maybe half a canter stride at the trot fence (a small white oxer), she’ll probably get penalized for that, but overall it was a nice respectable round. Isabelle Song is next. Good first fence, she finds the white rails nicely, finds a nice open distance where Bay had the rail, really laying down a steady rhythmical trip. 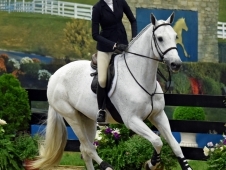 Makes a bit of a move up to the split rail one stride, gets the counter canter fence and trots all the way to the base of the white oxer, very correct, and a perfect open distance to the final fence. Great round! Sophie Gochman in the ring next. She finds fence one one a very forward stride, great demonstrations of the hand gallop, she slices the first of the white rails neatly, rubs the third in the series but not very hard, she finds the split rail one stride nicely, does a flying change to the counter lead and holds it perfectly to the counter canter fence, trots correctly over the white oxer, a little deep on the slice for the white rails the other direction and a solid final fence. Erika Jacobson finds fence one very forward as well, great gallop. She skips through the white rails easily, nicely down to the coop oxer. A little quick through the split rail one stride, she opts for a simple change of lead to the counter canter and struggles a couple times to get it. Trots the oxer correctly, slices the white rail nicely and finds the final fence well. Devin Seek also really shows off her horse’s hand gallop to fence one just like riders should, makes easy work of the white rails, finds the coop oxer well out of stride, is a little long into the split rail one stride but lands and holds the counter lead all the way around to the counter canter fence, trots the oxer correctly and finds the next to fences nicely out of stride. 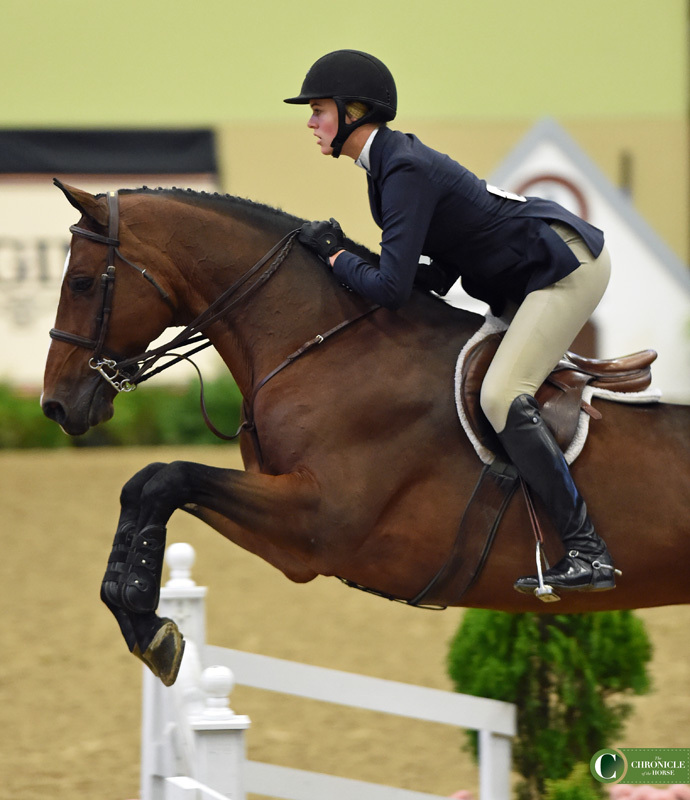 Caroline Bald has a great hand gallop fence, hits it perfectly out of stride. 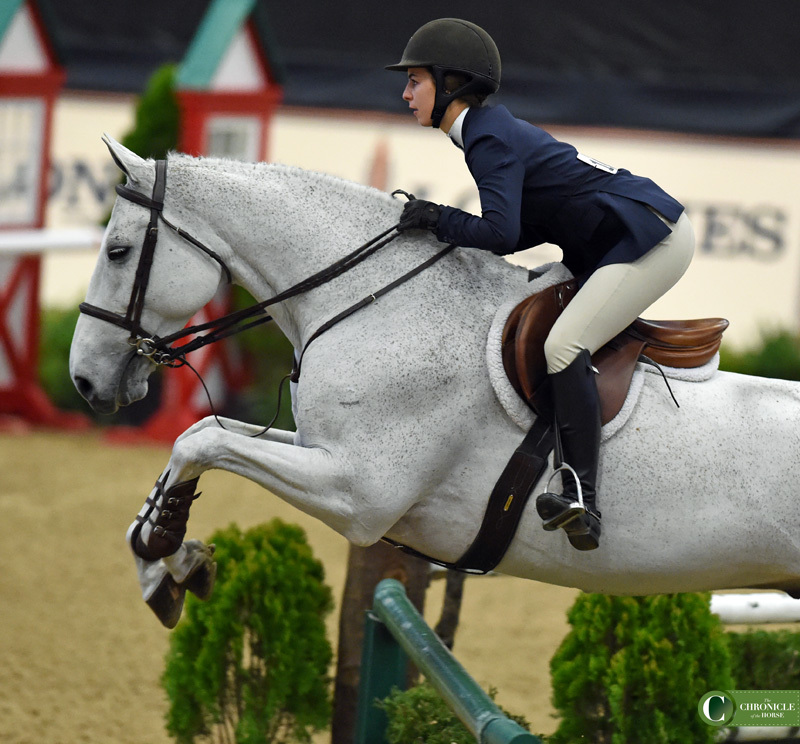 Finds the white rails well, find the coop oxer nicely, she finds the one stride slightly quieter than others have but it seems to be set in a way that encourages riders to find it off a forward step. Counter canters nicely to the oxer, trots the oxer correctly, slices the white rail very well and finds the final fence perfectly. A very solid round! Jessica Stone up next- really impressed with how all these riders are truly hand galloping the first fence, Stone is no exception, she finds it well. Beautiful through the white rails, hits the coop just so out of stride, finds the one stride of split rails about the best we’ve seen anyone so far, does a simple change to the counter canter and holds it to the fence, trots the white oxer correctly, slices the white rails well and finds the final fence out of a nice loping stride. Really well ridden round. Elli Yeager finds the hand gallop fence maybe a touch quieter than the rest of the field has, she opts for a straighter route at the white rails that works well for her horse, she finds the forward spot to the split rails and holds the counter canter on a shorter roll back turn than most have done. Her horse make an exuberant effort at the trot fence but does it correctly, the slice on the white rail and final fence come up perfectly. Its been a while since we saw Emma Fletcher- she was second in the ring out of 175 this morning and here she is back in the second round! She finds the hand gallop fence well, goes nicely through the white rails, slight rub at the white gate, she finds the split rail one stride on the more conservative step, holds the counter canter to the oxer. Her horse is a little awkward in his trot fence effort but technically correct, they find the last fence on a nice quiet stride. Abigail Grace Kelley in the ring next. Slight rub at the hand gallop fence but she found it well, a little deep through the white rails. She has the white gate down, goes well through the split rail one stride, simple change to counter canter and she holds it to the jump, very good trot fence, a little quiet distance to the split rail slice and a little open to the final fence but overall a respectable round. Devon Thomas’ horse gets a little excited about the hand gallop, he does it well but is perhaps a little on the muscle this round. He’s a very cute jumper and really making an effort over these new fences, they take the inside turn after the split rails and do a flying change to the counter canter, hold it all the way, trot the oxer correctly, find the white rail and the final fence well. Catalina Peralta has a brilliant hand gallop pace but an unfortunate swap off to fence one. The white rails come up a little awkwardly but she rights the ship and finds the split rail one stride well. 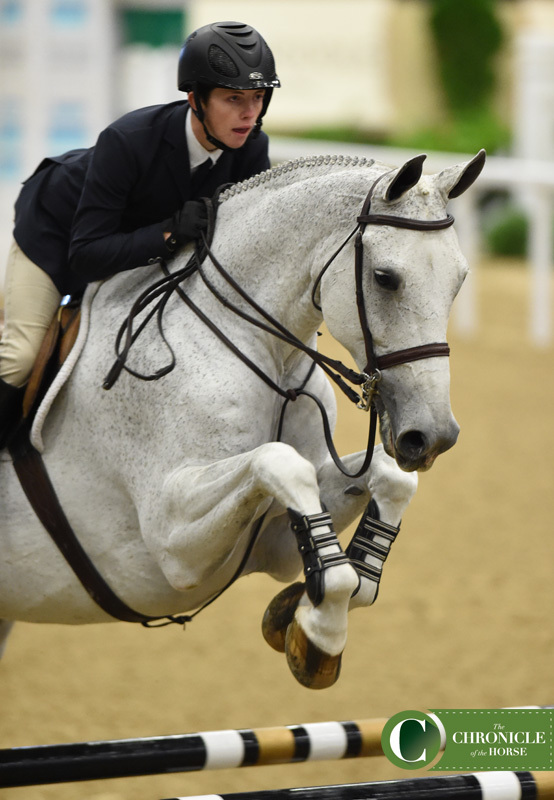 She does a flying change to the counter lead but her horse swaps back a few strides later, she trots the oxer correctly, finds the white rail a little conservatively and finishes well over the last. 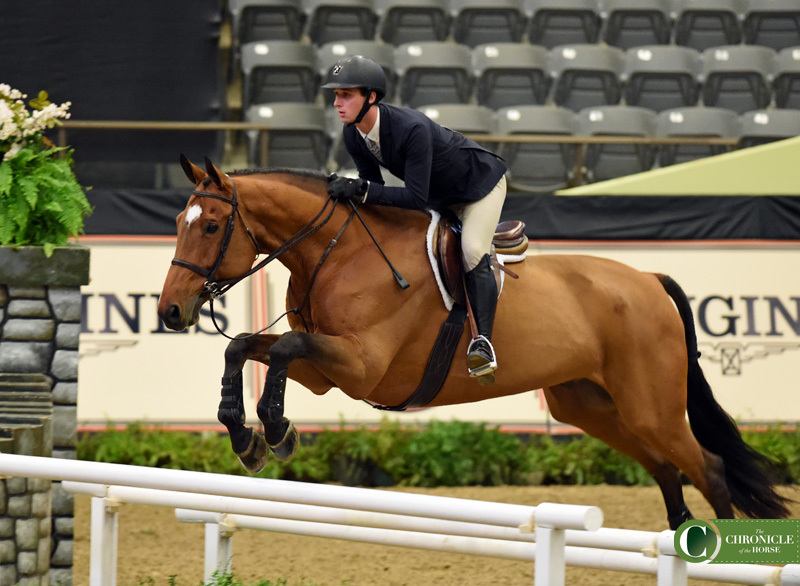 Tanner Korotkin is up next- he has a swap off to the hand gallop fence. He finds the split rails a little long, the trot fence is a tad awkward but Tanner rides through it well and finishes well on the last. Mimi Gochman finds fence one well and out of a bold pace- she’s a little long into the white rails but makes it work for her horse. She finds the split rails perhaps a tad quiet which is new, most have found them a little long. Holds the counter canter well, is a little quiet to the white rail but finds the last fence nicely. 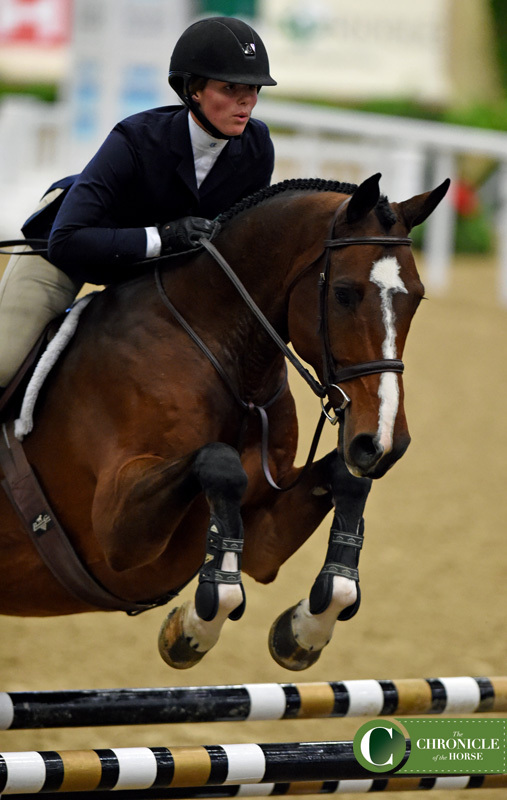 Farah Rizvi is a little conservative to fence one, her horse seems to favor a slightly slower pace. She finds the white rails well, finds the split rails well but rubs one slightly. She does a couple change and holds the counter canter well to the oxer, trots the oxer correctly and finds the last fence very nicely. Ellie Ferrigno has a great hand gallop fence, finds the first white rail well out of stride but is perhaps a tad quiet to the other two. Finds a reaching spot to the coop oxer but she gets it done, goes well through the split rail one stride, opts for a simple change and a wide turn to the counter canter fence and her horse does a flying change before the fence. 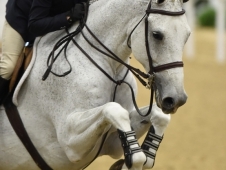 She has a half a canter stride before the trot jump, finds the white rail a little quiet but ends on a nice, beautiful forward jump. Kaitlyn Lovingfoss in next. She’s a little conservative in her hand gallop but finds the next few white rail fences nicely. 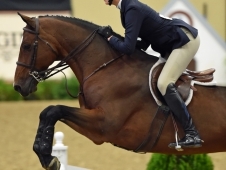 Goes nicely through the split rails, her horse gets a little excited and forward about the counter canter fence but comes back nicely for the trot fence. 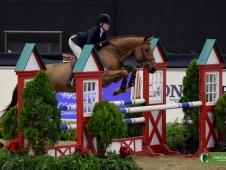 She finds the slice to the white rails really well and the final fence beautifully. 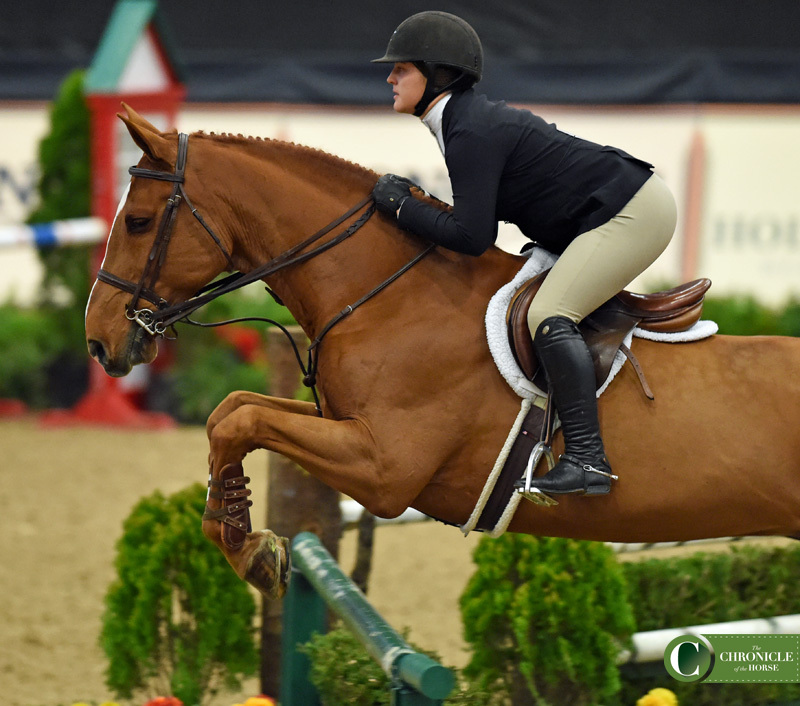 Alexandra Worthington finds a slightly quieter hand gallop fence than some. 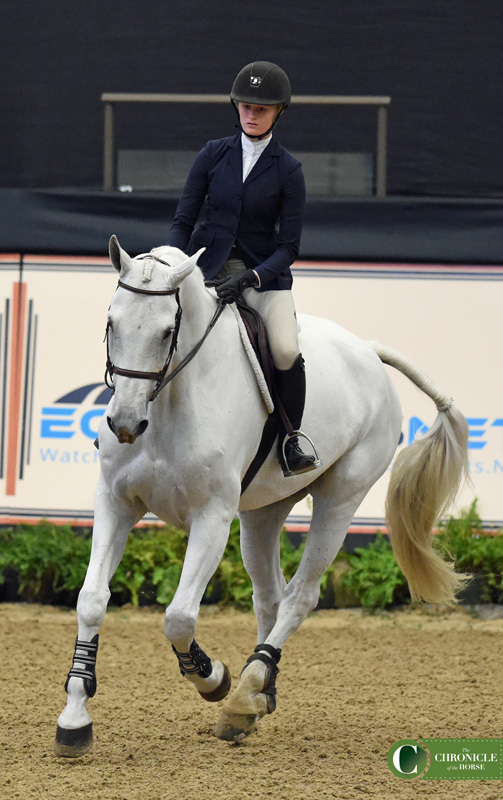 She’s nicely through the first white rail but her horse hangs a leg and takes the second one down, they both canter on and carry on with their course at least appearing relatively unfazed and she finds some nice fences toward the end. Ava Ellis picks up a gallop to put Kentucky Derby winners to shame and finds the fence very well out of it. She goes well through the white rails afterwards, slight rubs but nothing offensive, she finds the nice spot through the split rails but struggles to get the counter lead on the back side. After attempting a flying change she opts for a simple which she holds. 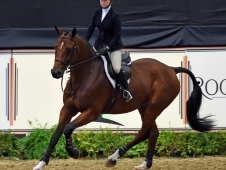 She canters a stride before the trot oxer. Paige Matthies does a good job with the hand gallop fence, she finds the first white rail the best anyone has so far, nicely over the next couple fences. She finds just the right spot to the split rails, gets the counter lead and holds it very well with a tight turn to the counter canter fence. Holds the trot to the base of that fence and finds the last two fences very nicely. Probably one of the best round we’ve seen so far. Emma Kurtz is in the ring next. She finds a nice forward spot to the hand gallop fence, goes well through the white rails, good over the coop. The split rail line gets a little quiet for her but she makes it work, gets the counter lead and holds it all the way to the fence, trots nicely to the base of that fence, does a very tidy turn after the sliced white rail and finds the final fence beautifully. Big cheers in the Alltech for that round. Coco Fath finds the hand gallop fence well, maybe slightly on the conservative side of what we’ve seen so far, goes through the white rails very well, gets the counter canter with a flying change and holds it all the way to the oxer, trots all the way to the base of the trot fence, finds the white sliced rail a little conservative but ends on a beautiful fence. Daisy Farish in the ring now- she swaps off to the hand gallop fence, finds her way through the white rails well. Is a little happy to the coop but makes it work, does the split rail line about the best we’ve seen it, holds the counter lead all the way through to the jump, trots all the way to the base of that fence and finishes on a nice spot to the last oxer. Sam Walker is up next- he finds the hand gallop fence a little quiet, goes well over the white rails, a little happy to the coop but he makes it work well, very nicely through the split rail line, great change to the counter lead which he holds well all the way to the oxer, trots all the way to the trot fence albeit with a little gap, finds the final fence well. Brian Moggre will be our last rider for the second round- he finds the hand gallop fence pretty conservatively as well, goes well through the white rails with just a light rub, finds a good spot to the coop and goes well through the split rails, does a very tidy and handy turn holding the counter lead to that oxer, trots all the way to the base of the trot fence and finds the final fence well out of stride. It will be a close call for the judges! They can either pin the class now or bring the top few riders back for additional testing. We will let you know what they decide! The groups are in reverse order of merit with group C being the top ranked group. 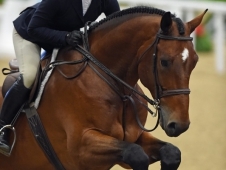 Riders are being asked to demonstrate a posting and sitting trot, and extended canter and a counter canter. At the conclusion of all three flat group we will let you know who is called back to jump again! Good morning and welcome to the Maclay Finals! It’s 7 A.M.! It’s so early! 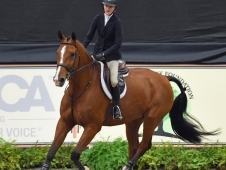 But y’all just sleep right on in because The Chronicle has got you covered with round by round commentary from the ASPCA Maclay Championship. Your commentator this year is me, Ann Glavan! 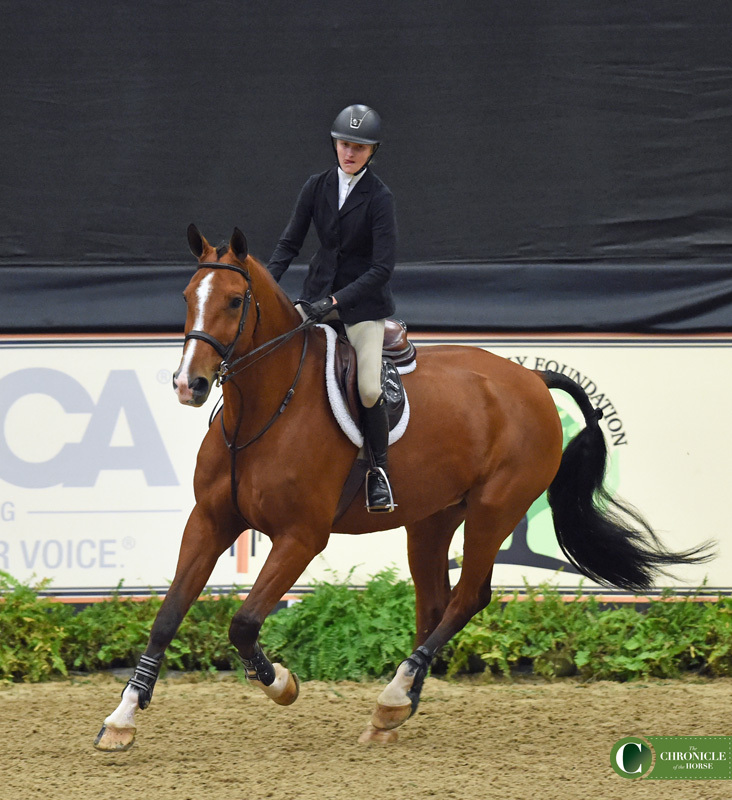 I’ve had the pleasure of watching all 1,235,234 billion Maclay Finals rounds for the past four years, and while I can barely ride a respectable 2’6″ jumper round I feel TOTALLY prepared to give you some thoughts on these top notch equitation finals rounds. They say those who can’t do teach, but I think those who can’t do JUDGE, and I lovveeeee judging. Disclaimer: We’re providing this as a service to those who are interested, and we’re just recording our observations. 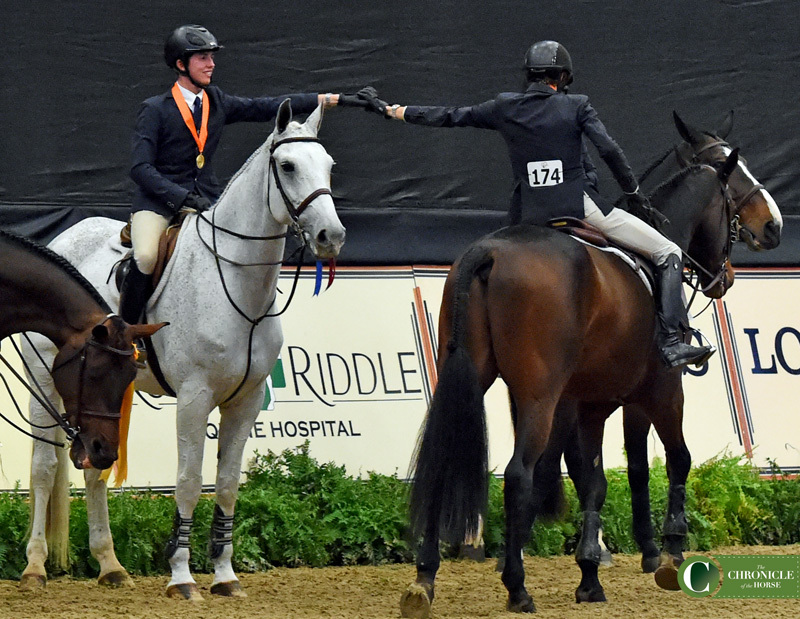 We’re not judges, just reporters who have watched the Maclay Finals in their entirety for the past 16 years. You may not agree with our notes, and that’s fine—we’re not putting them out there as the authoritative word, but as information for those interested. That said, read on! Let’s jump right in with the action here in the Altech Arena. If you want an order of go or course map click here. 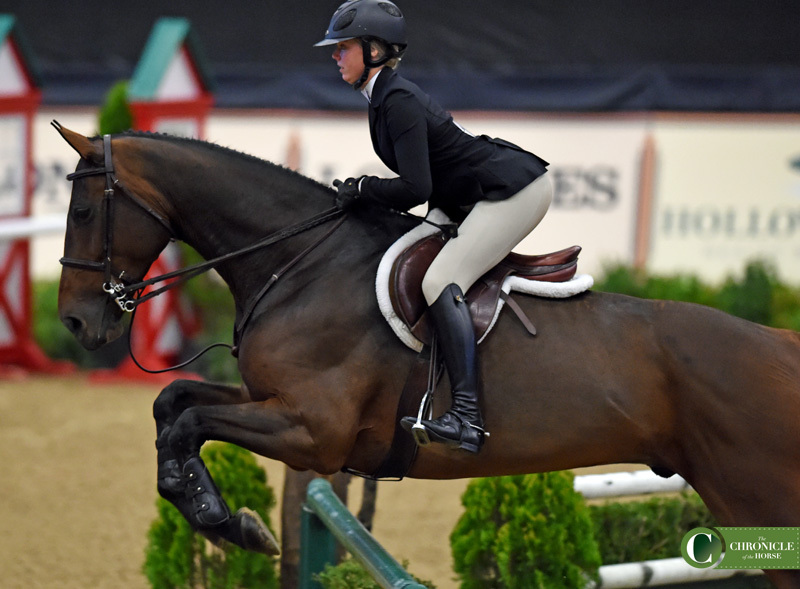 Assuming no one scratches we’ve got 175 riders to compete today, and we’re starting with Katherine Lenkart. Lenkart had a couple rails early in the course but then she settled into a rhythm and finished the course out well. Never easy going first! Emma Fletcher had a really impressively smooth trip, just found each fence out of stride. Reminds me of the year McKayla Langmeier went first in the first round and ended up laying down the top trip of the day-we would be very surprised not to see her in the call back round! Maverick Helmer gets the first line done very correctly, no rub and no rail. His round was quite smooth, you may see him later today. 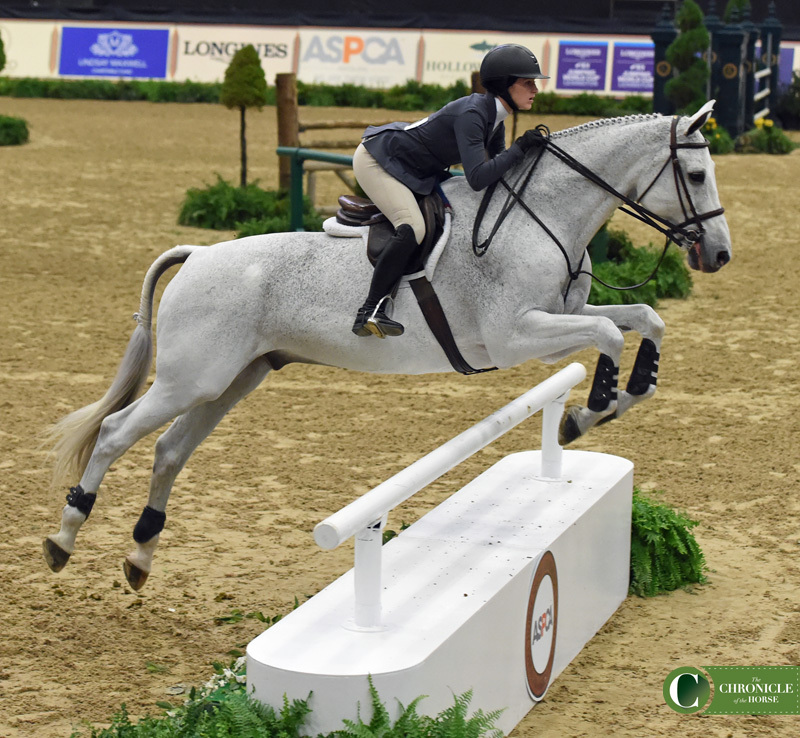 Ava Laplante is on a really stylish jumper, they just have an unfortunate deep spot and rail and a bit of a long shot to the final fence, but they get the job done. Gigi Moynihan nails the first line. she pulls the same rail Ava did but it was just a light rub, otherwise a very rhythmical solid round. 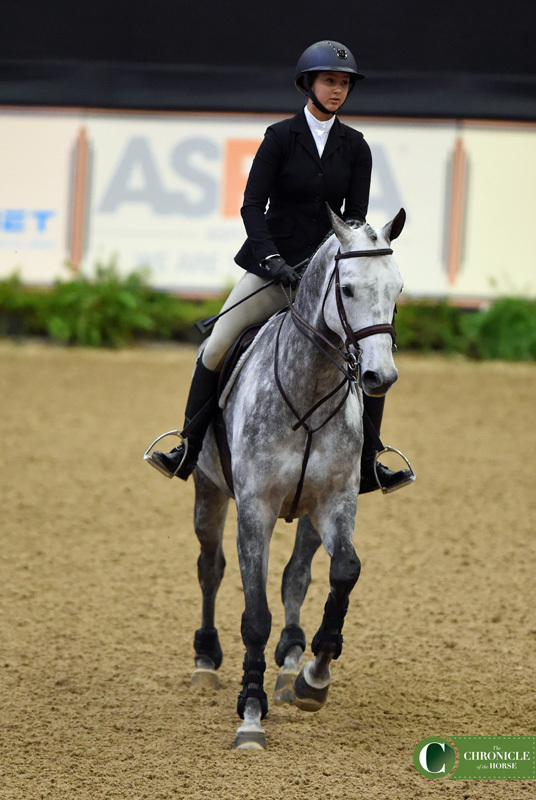 Aristea Santoro’s horse is a really cute, eager gray. 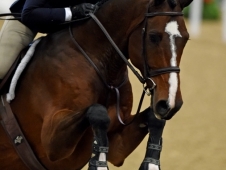 He’s got his little ears perked looking around the course like he’s ready to rock, and by in large they do! A swap off to the vertical before the double but overall great riding from Aristea and a real cute horse. Maverick Helmer. Photo by Kimberly Loushin. Belle Zachary up next- she gets a little deep into the second diagonal line but wraps up the round with some good jumps. Really everyone is laying down pretty solid trips so far. 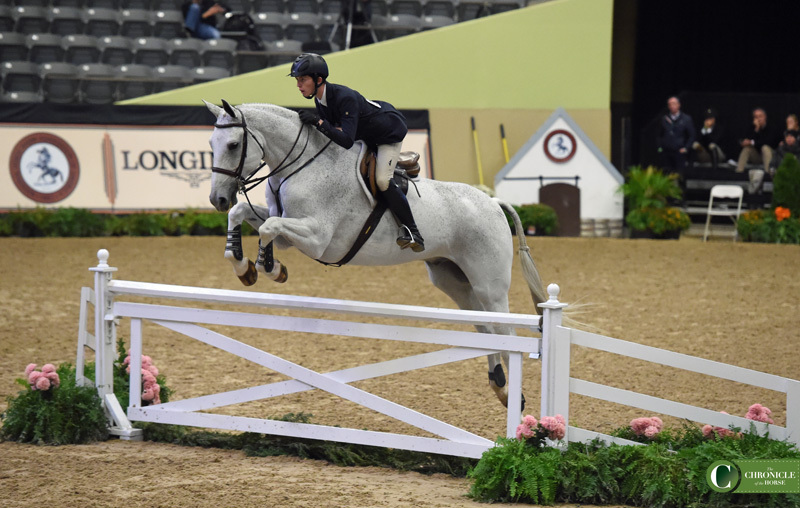 Avery Glynn’s horse seems a little backed off the fences–he adds at the middle vertical in the first line before stopping at the hedge oxer, but Glynn is a tough nut. She digs in and gets the job done, gives the horse a good school in the process. Well done, Avery. Sabrina Hall pulls that third rail- seems like that will end up being our bogey fence of the day, though some judges don’t mind a rail pulled by a light rub. Hall gets a little deep a few places but she kicks on and finds her rhythm by the end of it. Grace McReynolds horse is jumping very cute and bold, Grace did a great job staying with him and found all the fences quite well. Samantha Smith gets a rub but no rail at fence three. Her horse swaps leads a few times in the middle of the longer lines but not in front of fences, we’ll see if the judges mind that because otherwise it was quite a solid round. Alexandra Worthington (The Chronicle’s One To Watch!) lays down a very rhythmical performance, we’d be surprised not to see her later today. 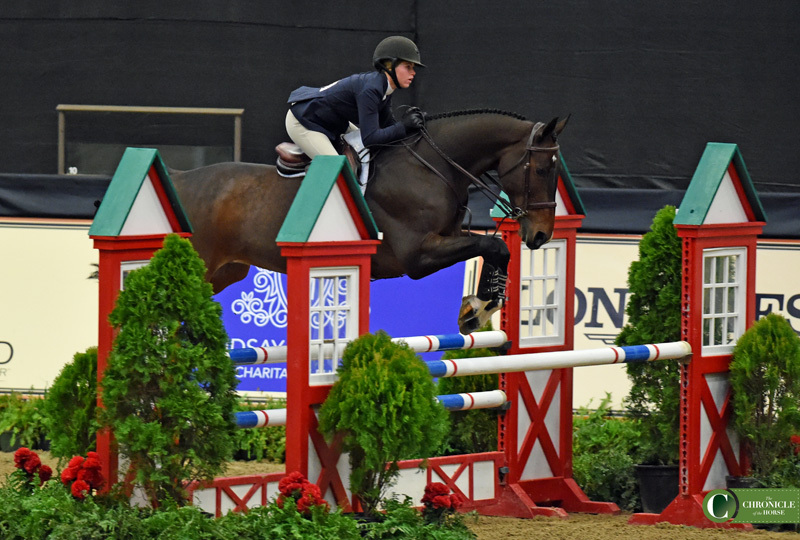 Alessandra Dipietro’s horse is a little spooky and tried to stop at the hedge oxer, but Alessandra digs in and gets him over it, finishes out the round quite well. Alexandra Worthington. Photo by Kimberly Loushin. Natalie Jayne pulled the rail at the second fence, first we’ve seen that come down. She gets a little quick a couple places around the course but gets the job done well. Grady Lyman does one of the best jobs we’ve seen of getting the five done nicely in the first line but has an unfortunate stop at the hedge oxer. A few horses have stopped at that one- it’s out of a short corner and definitely a touch spooky. Grady digs in and gets her horse over it the second time and she finishes out the round well. 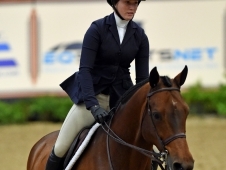 Ashley Vogel has a few rubs around course but really finds everything out of stride well and lays down a good trip. Jessie Goodwin carries a good forward pace and gets the job done nicely. Sophie Steckbeck pulls the rail at the vertical before the double, but otherwise a good trip. We’re talking amongst the Chronicle staff, I think this is one of the softer first round courses I’ve seen at a Maclay Final, challenging but no tricks. My colleague Kimberly Loushin thinks it’s deceptive- set up to ride very flowing if you do it right but will catch you off guard if you don’t know where you are in the lines. You’ll have to let us know what you think! Dominika Silvestri’s horse is jumping very cute, they get deep to the vertical before the double but kick on for a good finish. Aubrienne Krysiewicz-Bell gets deep to fence one and ends up adding. She’s a little deep other places early on the course but she figures it out and kicks on for the rest. Nina Columbia gets that first line done really well, she’s doing a great job holding her horse together. Gets a little deep and pulls the rail at the vertical to the double but wraps up well. Kayla Wolfe up next- that first line catches her and she pulls the third rail. Get’s a little deep into the next diagonal and has an unfortunate stop at the middle fence. She gets over that fence on second attempt but has a stop in the next double. We’ve all been there, Kayla! Celia Cram gets deep and adds in the first line. 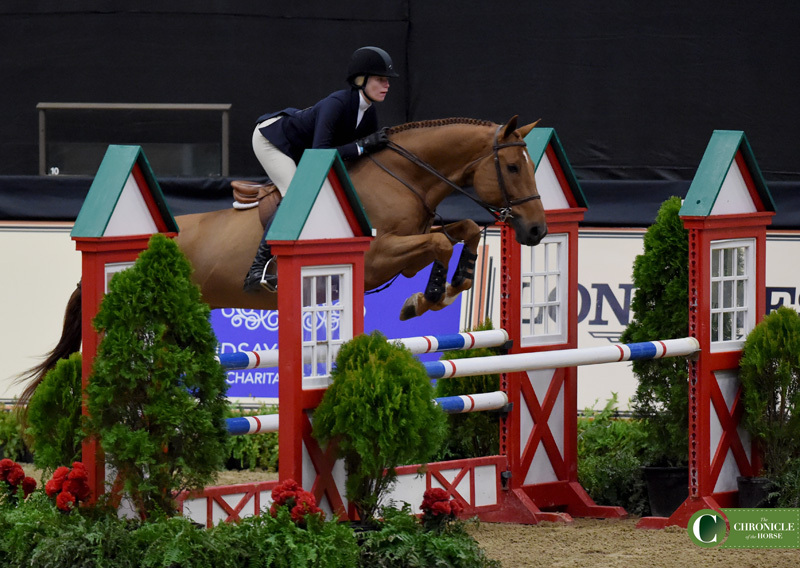 She has a little trouble settling into a rhythm and pulls a rail later on course, but they also just announced she is a sophomore in high school, and I certainly wasn’t doing anything as impressive as Maclay Finals at that age, so well done Celia! 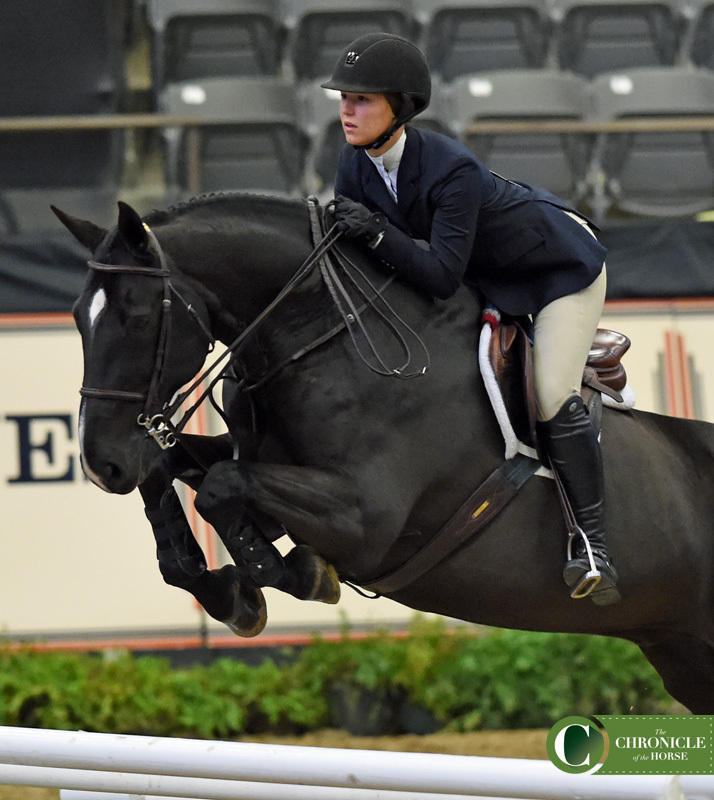 Abigail Lefkowitz laid down a solid trip with just a couple rubs around course. 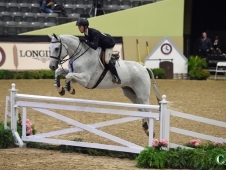 Nicolas Gamboa pulls a rail at the first fence, the signature Maclay white standard-less triple bar. He finds his rhythm later in the course and finishes well. Alexa Aureliano up next- she’s got a nice steady loping pace, makes for a nice picture. She maybe gets a touch deep a couple times, and she does pull a rail at the second to last, but overall a good job. Owen Gajoch’s horse does some actually pretty impressive tempi swaps in front of a couple fences. Super cute jumper, shame on the swaps because it’s otherwise a smooth round. Rylee Shufelt gets a little deep some places early on course and to the final fence but she figures it out and has a nice middle to her course. 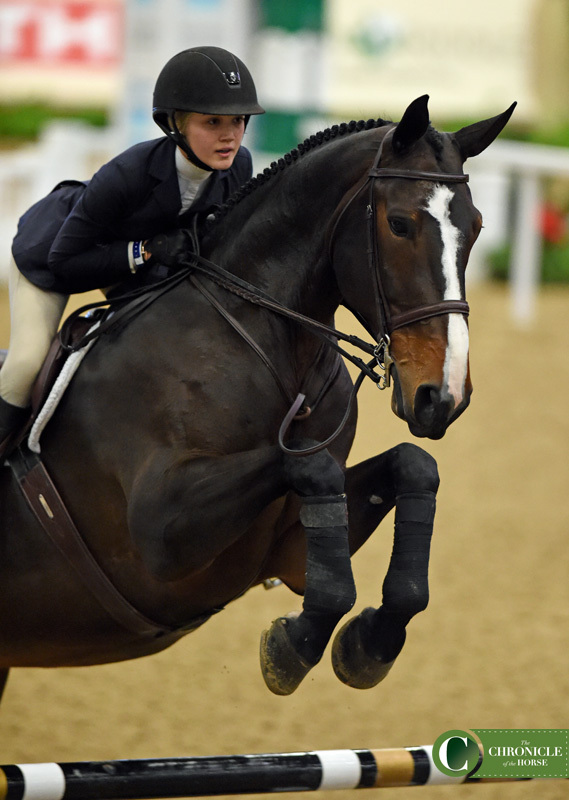 Violet Barnett is coming off a win in the junior hunters at the National so props to her! 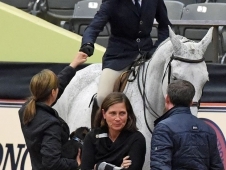 It’s her first Maclay Final and she gets a touch deep some places, has the rail at the vertical to the double, but gets it done and gets around her first time at the finals so bravo! Alexis Ortiz up next- she gets a little deep to fence one but overall has a nice trip. 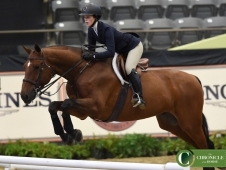 Amelia Campbell is another Maclay Finals first timer. Her horse makes an adorable exuberant effort at fence, poor guy is a little spooked by it all and stops at the next fence, and then stops at fence four. 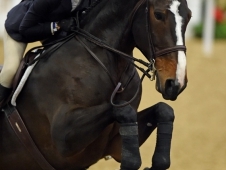 Really a cute jumper and a good effort by Amelia to help him around, I’m sure we’ll see them back next year! 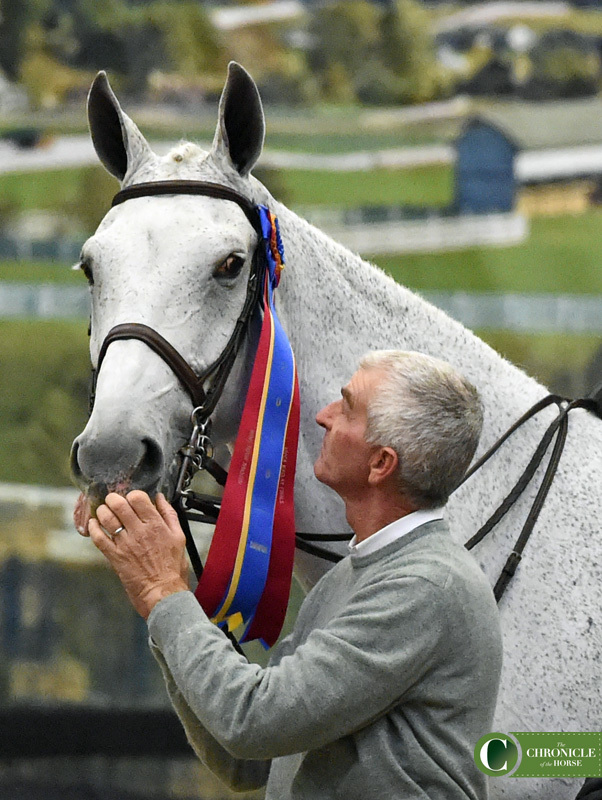 Sam Walker has the distinction of riding to both the champion and reserve finish in the large junior hunters earlier in the week at The National. He’s been placing well at all the equitation finals so we can expect a good performance here. 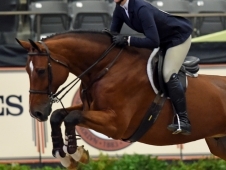 His horse goes around with his tongue out, probably as a taunt to the others in the warm up ring because he lays down one heck of a trip, I think we will definitely see him back later. Sam Walker. Photo by Kimberly Loushin. 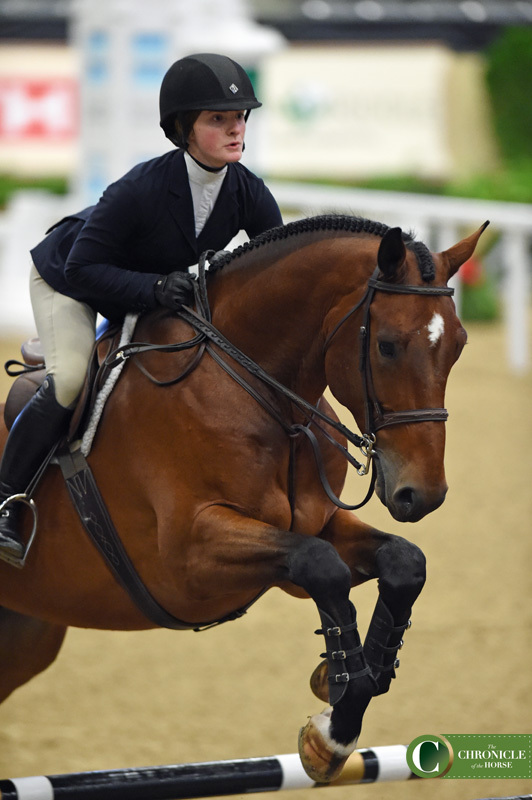 We’ve got back to back great rounds because up next we have Coco Fath, last year’s second place finisher in the final. She lays down an excellent first round, you’ll see her back later today no doubt. Lizzy McCrady has a stop at fence two but she digs in to get it done on the second attempt, and she gets her horse around the rest of the course. 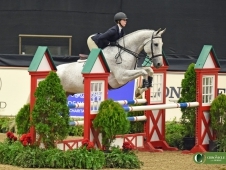 Paige Towers gets a little crooked in the first line when her horse looks at the fence but she gets it done. Pulls the rail at the oxer on the long wall but finishes out the course well. Grace Pearson is here all the way from Seattle, west coast represent! She has a swap off in the second diagonal line and a hard rub at the vertical to double, another rail at the second last fence, but really gets the horse around well, just tips some rails with his toes. Erika Jakobson gets a bit deep a couple places and has some rubs but finishes the round well. Alexia Rule adds out of the outside line and gets a little long in the second diagonal and deep to the last fence, but she gets the job done. Coco Fath. Photo by Kimberly Loushin. Time for our first drag break here at the Alltech Arena, get yourself a cup of coffee and settle in for the second wave of riders! 45 down, 130 to go! Sam Walker, Coco Fath, Alexandra Worthington, Emma Fletcher, Erkia Jakobsen, AshelyVogel, Abigail Lefkowitz, Lielle Rhodes, Natalie Jayne, Alexis Ortiz, Gigi Moynihan, Maverick Helmer, Sophee Steckbeck, Belle Zachary, Alexa Aureliano, Annika Singh, Grace McReynolds, Jessie Goodwin, Addison Reed and Aristea Santoro. Catherine Moorehead pulled a rail and had a couple deeps spots. Sophia Pilla is a little holding here and there, little deep or long but gets the job done just fine. 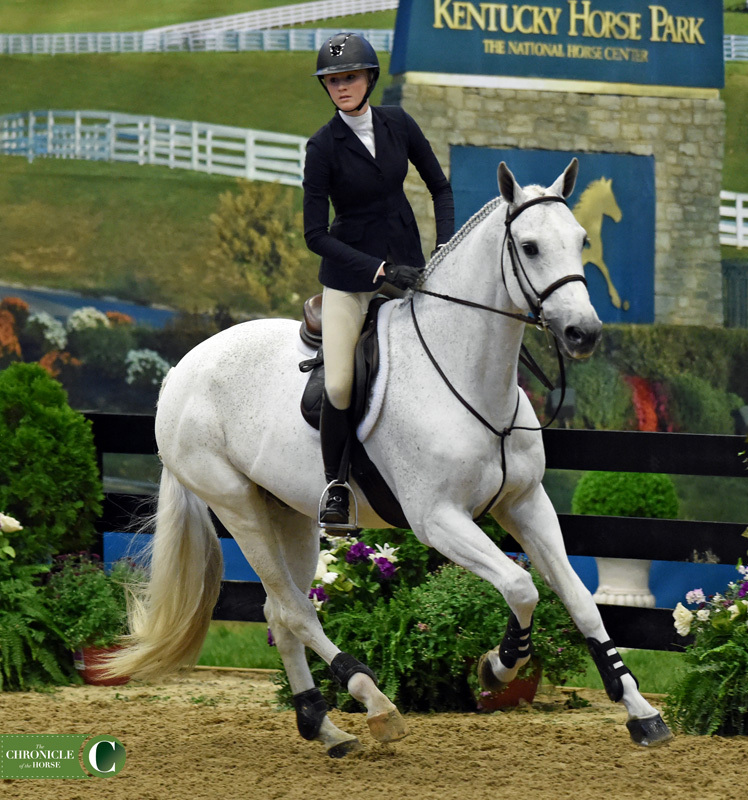 Daisy Farish up next- another rider we can expect a great round out of, she won the USET Talent Search Finals earlier this season. Really steady, solid round- this isn’t Daisy’s first rodeo, and you can bet we’ll see her back later today. Molly Canfield in the ring now- has a couple of rub and drifts out on the standard less vertical toward the end but overall a good round. Daisy Farish. Photo by Kimberly Loushin. Elli Yeager laid down a really solid trip, we’ll probably see her on a standby list. Caroline Bald lays down another excellent trip- three impressive trips in a row here! Emily Williams keeps the streak alive with another great round, just a couple of rubs. Big crowd cheers for Emma Wujek, just keep the good rounds coming, kids! Isabel Harbour gets a little quick a couple places but overall a solid performance. Elli Yeager. Photo by Kimberly Loushin. Tanner Korotkin gets a little deep to fence one but finds a good rhythm soon after and lays down a nice trip. Tessa P. Brown gets a little deep here and there, has a swap in the middle diagonal line and misses a change at the end but powers through the course and finishes it out. Jennifer Staniloff turned in a nice, solid round. Caroline Passarelli pulled the rail at fence three. She’s on a cute and quick little eager horse, they easy work of the rest of the course. Hannah Dodd is representing Missouri at the finals (love it! Mizzou fan here!). She lopes around on a nice pace for a solid trip. 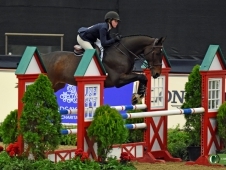 Abigail Tinsley gets little long to the hedge oxer, a little deep to the last fence but some beauiftul fence in between. Blair Spencer trucks around at a good pace and finds the fences well, a good trip. Brooke Morin is a little late getting the second part of the first line done, but makes it work. She gets the next diagonal done very well, finishes of the course quite nicely. Tanner Korotkin. Photo by Kimberly Loushin. 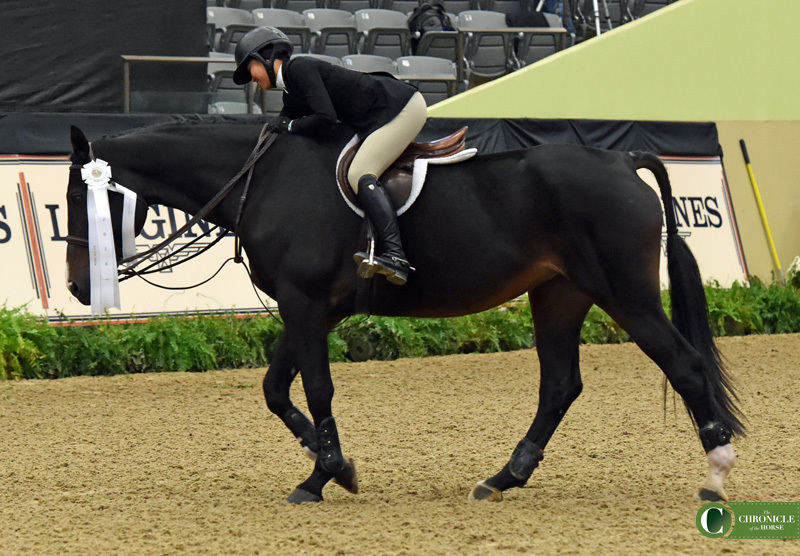 Emily Lucibello also gets a little snug trying to fit the five in that second part of the first line, it’s turning out to be a bit of a deceptive test for riders to shorten up the stride and keep impulsion early in the course. Madison Hill does it in four, a bit of a long leave out. Her horse is nice and eager, definitely no stop in this one! They cruise right around. Charleez Simcik gets the five done well but is a little deep to the next fence. She’s maybe a touch quick and gets long to the final but gets the job done. Zanya Rizvi gets the five done a little late, does a really great ride in the next diagonal line though. Really rides the last part of the course well. Sophie Transou has a couple of deep spots but nothing tragic. 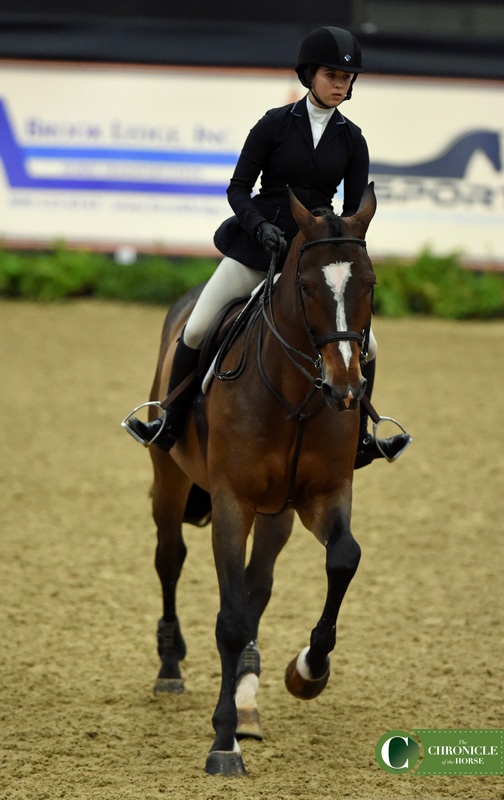 Alexandra Pielet rides the first line well, her horse is very nice and adjustable through the lines. Bit of an odd effort at the vertical to the double but a good round, we will probably see her called back. Sophie Gochman gets the five done really well, has to move up a bit in the next line but does it well, the next diagonal line is quite smooth. I bet we’ll see her called back. Alexandra Pielet. Photo by Kimberly Loushin. Irene Powlick pulls the rail at three, her little horse is very cute and does his best to truck right on down the lines and jump out with the little hunter gap. A solid round. Austin Krawitt has a few swaps in the outside line and his horse makes a bit of an awkward effort to the second to last fence but he finishes the round well. Jake Parker Wymard gets a little off his track down the first line and pulls the first rail. Couple other deep spots but he hangs in there and gets the job done. 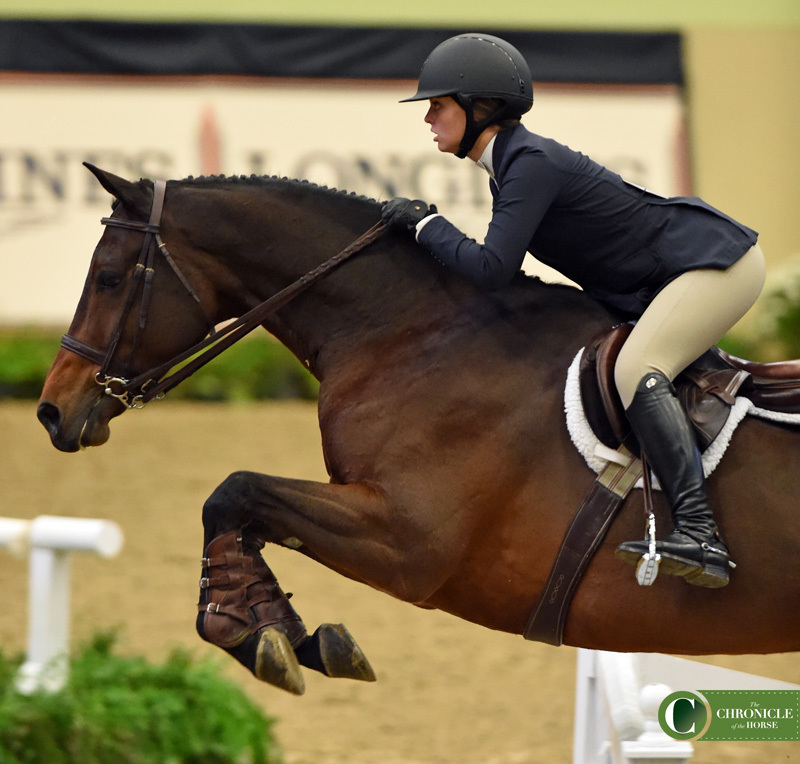 Lanie Walkenbach’s horse is a bit of an eager beaver down the first line but fits the five in. They carry a good forward pace all the way around and it works for them, I think we may see her back for the next round. Abigail Beaty’s horse second guesses the four stride line a bit and makes an awkward effort. He stops at the hedge oxer but she gets him over it the second time. They have a couple other deep or long efforts but make it around just fine. Hannah Eddlemon pulls the rail at the vertical to double but delivers an otherwise solid round. Michela Pritchett pulls the rail at fence three. Lilly Clarkson gets a little deep into the second diagonal but makes it out fine, pulls the rail at the vertical to the double. Taylor Griffiths does one of the best jobs we’ve seen getting the first line done smoothly. Maybe a touch deep to the hedge oxer but overall a pretty solid trip, I bet we’ll see her back later. Josey Walker gets a little quick down the first line and swaps off a few times. Otherwise its quite a nice round, shame about the swaps. Ellie Ferrigno is laying down a great first half of this course, really finding things out of stride. She keeps it up, we’ll probably see her later. Katelyn North had a couple swap offs in the first line before stopping at the brush oxer. She got the oxer done on second attempt but unfortunately had a run out at the next fence. Ellie Ferrigno. Photo by Kimberly Loushin. 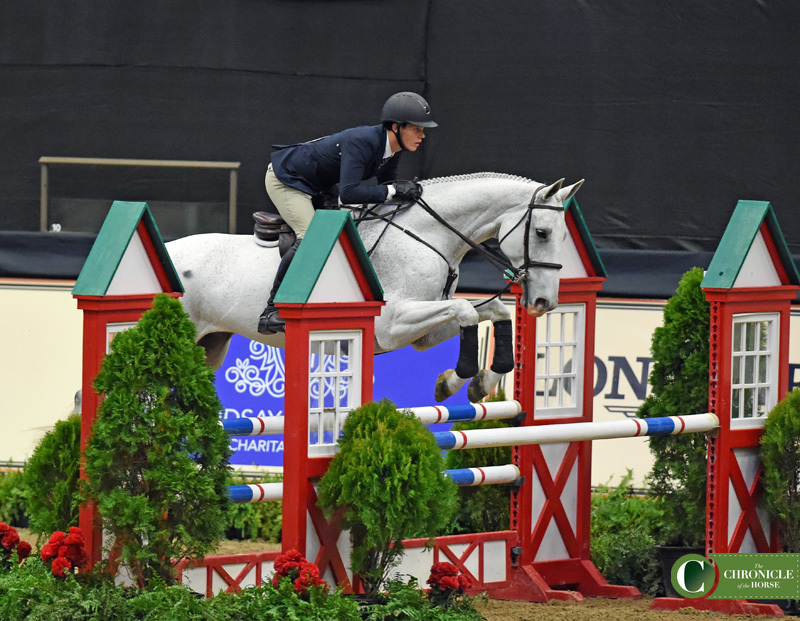 Celia Bresch’s horse makes a really cute effort at fence one, cute jumper, but wants nothing to do with the brush oxer out of the short corner and stops about three strides away from it. She gets him over it on second attempt. She makes it through the rest of the course. Bay Noland-Armstrong’s horse is super adjustable in the first line, she’s laying down a nice trip. They maybe get a touch slow and stuck off the ground in the next line but not offensively, I think we may see her called back for that trip. Hope King maybe gets a little quick a few places but overall a solid trip. Kate Abajian up next, she pulls that tricky third rail. Maybe gets a touch long to some fences at the end of the course but a good round overall. Kathryn Hall pulls that third rail too, the trick really seems to be to get that first four done early so you can already be waiting for the five in the air. She has a hard rub but finishes the course well. Isabelle Song does the first line just right, she rolls around the course at a nice solid pace and doesn’t have to change much to find the fences, I think we’ll see her called back. Sophia Zuckerman doesn’t quite get that first line done and pulls the third rail. Clocks around the rest of the course just fine. 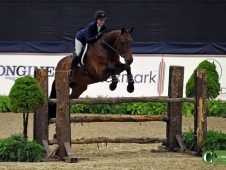 Kaitlyn Williams makes a bit of a big at the hedge oxer but it works out, the rest of the course goes quite well. 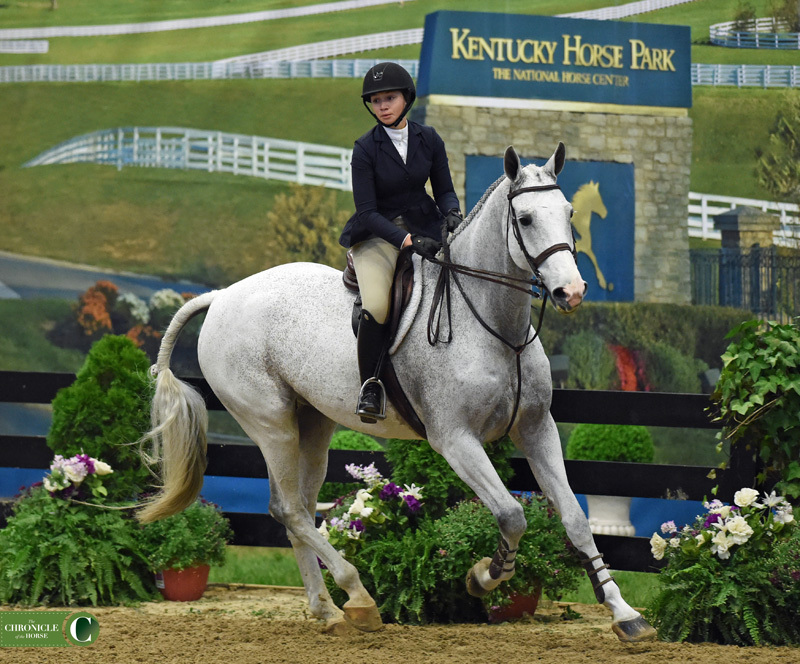 Carson Ruff is rider number 90 in the ring and our last before the second break-her horse trips badly in the footing between fence two and three and she’s able to jump out but has the rail. She keeps it together to close out the round well. We have our second standby! This is in order of judges preference after the first 90 rides. Sam Walker, Coco Fath, Daisy Farish, Alexandra Worthington, Ellie Ferrigno, Tanner Korotkin, Emma Fletcher, Noland Armstrong, Ellie Yeager, Isabelle Song, Erika Jakobsen, Caorline Bald, Sophie Gochman, Ashley Vogel, Alex Pielet, Brooke Morin, Molly Canfield, Taylor Griffiths, Abigail Lefkowitz, Lielle Rhodes, Emily Williams, Natalie Jayne, Alexis Ortiz, Gigi Moyihan, Maverick Helmer. We’re back with the third rotation. Alice Kass got a little wiggly in the first line but made it work. Isabella Russekoff was a little bold into the first line but made it work and got out with just a rub, no rail. 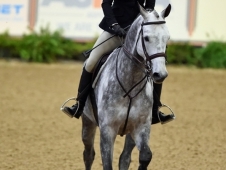 Emma Catherine Reichow is mounted on a very cute, very eager gray. 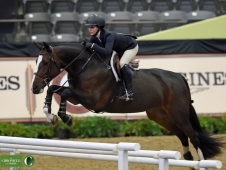 He really pops up over the jumps and Emma rides him nicely, they bound right around the course. Tessa Darling up next, she has a really great rhythmical first line but gets deep to the brush oxer in the corner. Recovers well and finishes the course nicely, her horse is like a metronome, very steady. 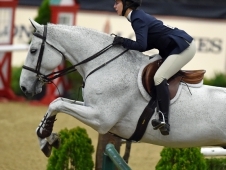 Julia Stone has a couple of stops at the brush oxer unfortunately. Kierstin Antoniadis in the ring next-she pulls a rail at fence one and rubs fence three but she rides them both fine, just a bit unlucky. 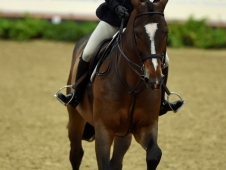 She really rides the whole round quite well, will be interesting to see if judges hold the rails against her. Bella Kay gets the first line done well, she’s maybe a little close to a couple jumps on course and a little long to the last fence but overall a solid trip. Luke Sassi in the ring now. The announcer says this is his first Maclay Finals and so far he’s doing a great job with the course! Does take the first rail down but gets that first line done, is maybe getting a little forward and close to the outs of these lines but handles his horse well. Farah Rizvi in the ring next, she’s clocking right around like a seasoned eq rider even at 15 years of age, she turns in a really solid trip, I bet we’ll see her called back. Paige Matthies next- she gets a little deep into the second diagonal line but makes it out fine, overall a nice ride. Ana Bertozzi does the first part of the course well but has a pop chip out of the line and another one into the double that cause a stop. She represents and gets the job done, she runs into trouble in the one but kicks through it and finishes the course. Emma Crate in now, she does the first part of the course quite well and gets a little quick in the second half but a solid ride all around. Kaitlyn Lovingfoss. Photo by Kimberly Loushin. 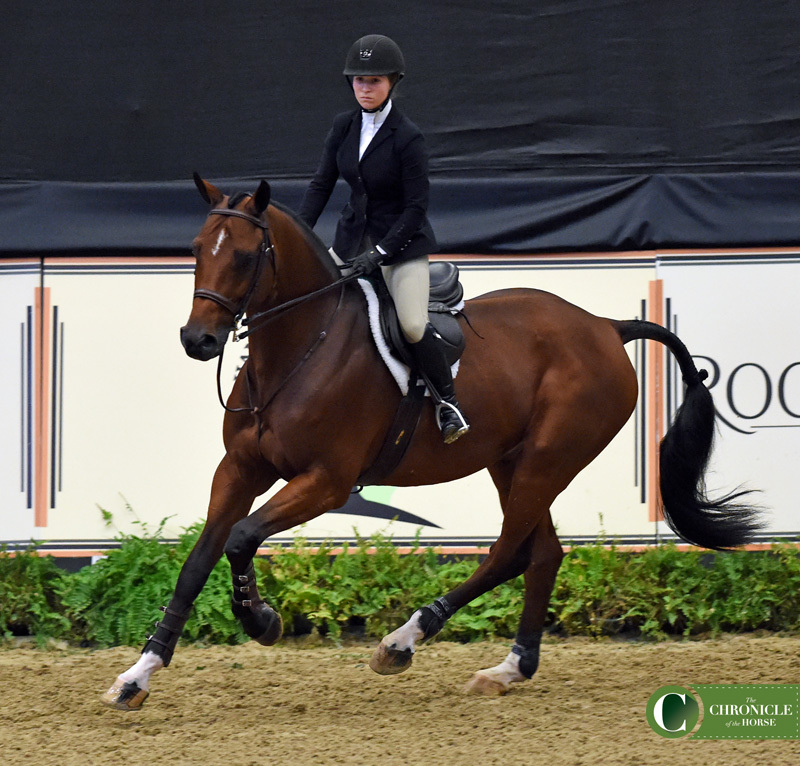 Kaitlyn Lovingfoss does a great job down the first line, great at the next few fences as well, really finding everything perfectly in this horse’s stride, I’d say it’s one of the smoother rides we’ve seen, you’ll surely see her again later today. 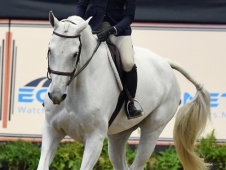 Then we have Annabel Revers, always someone to contend with in the equitation. She gets a little long into the second line and has a very unfortunate swap off into the diagonal line, a shame, otherwise a great round. Alison Raich is making this course look quite easy, a light rub at the second last but that’s about it, really a good round. 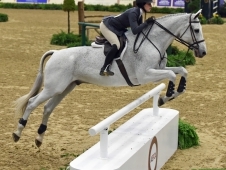 Anna Marie Mayes’ horse second guesses the distance at fence two and makes a bit of an awkward effort. He’s a little sticky off the ground a few other places but she kicks on until he refuses the second last fence, the standard less white rail. They jump it on the second attempt and finish the course. Annabel Revers. Photo by Kimberly Loushin. Tess Lenihan in now- she pulls that darn rail at the third jump, has a couple deep spots early on course but finishes it nicely. Paulina Terranova pulled that third rail too, other wise a solid trip. Katy Merchant in next, she keeps a nice slow and steady pace throughout the course for a solid trip, we may see her back later today. Cate Tomlinson carries a great pace all the way around for a pretty, solid trip. Beata Buckley gets deep to fence one and elects to circle before carrying on, she pulls the rail at fence three and has a second stop at the vertical before the double. Ella Frey is a little long and a little deep here and there, pulls the rail at the second to last fence but a good ride. Madison Mitchell in next, she has a stop at the brush oxer but gets over it on the second attempt. Couple other awkward distances but makes it around. Ellie Beard has a bit of an awkward jump two, a few riders have had this problem with the long four strides, they really have to make sure the horse knows it’s leaving the ground on four. She takes the rail down at three but makes it through the rest of the course well. Now Breanna Bunevacz- she pulls the rail at three- she and her horse have a really nice pace around course, they deliver a solid round. Alida Treuting has a swap out at fence three. Jessica West pulls rails at three and five. Jackie MacDonald gets a little quick down the first line but makes it work, she has a swap off down the next line. 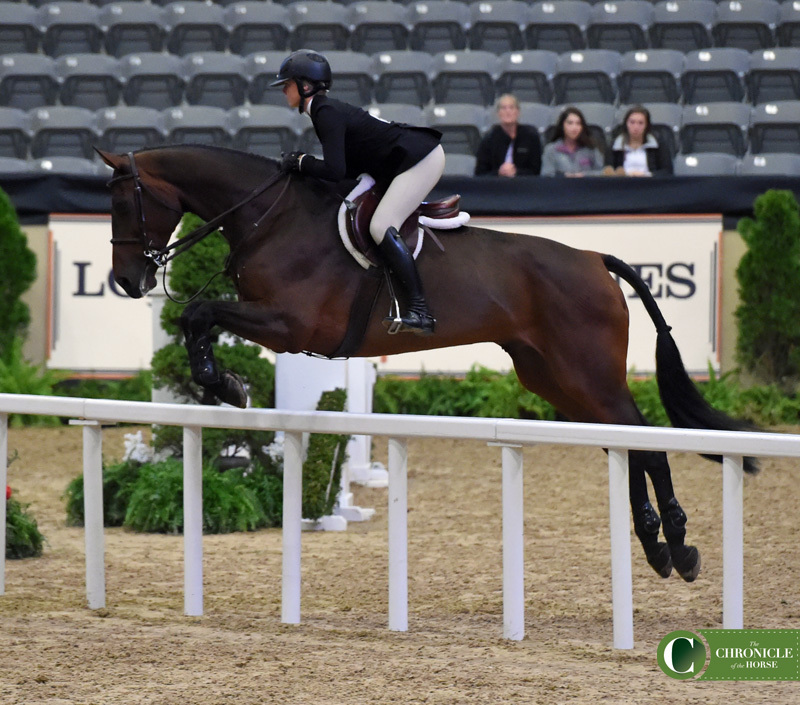 Catalina Peralta up now- once she finds her rhythm after the first few fences the rest of the course was quite good. 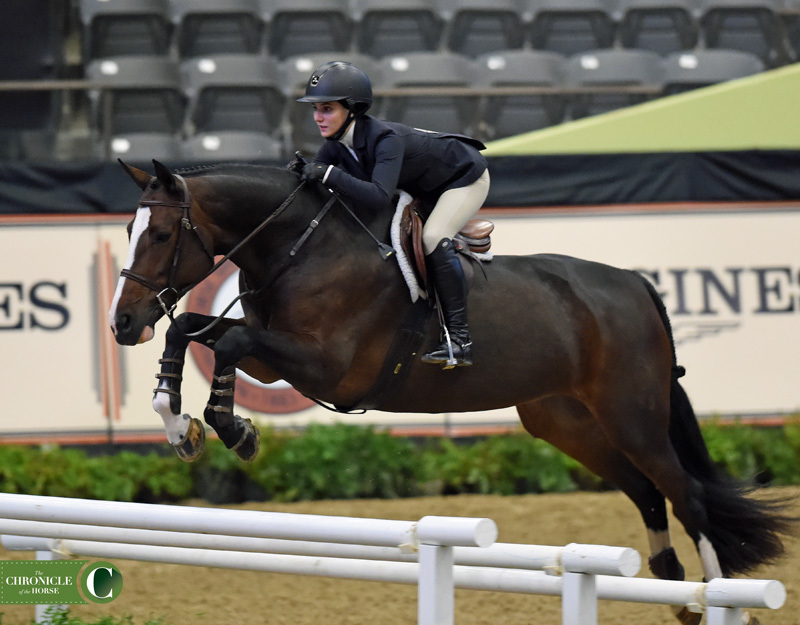 Ava Stearns does the first line just right but is maybe a touch deep to the next oxer, and a little deep to the last fence. Rest of the course was solid. Lauren Lindner gets a little deep coming out of the first line but makes it work, no rails. She gets rocking and rolling for the rest of the course and finds everything quite nicely, maybe just a little deep to the last. 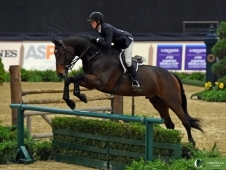 Hallie Grimes horse wants no part of the hedge oxer, he stops well before it. They jump it the second time. Chloe Murt swaps off to fence one and gets deep to the brush oxer at four. She finds her rhythm as the course goes on and finishes nicely. 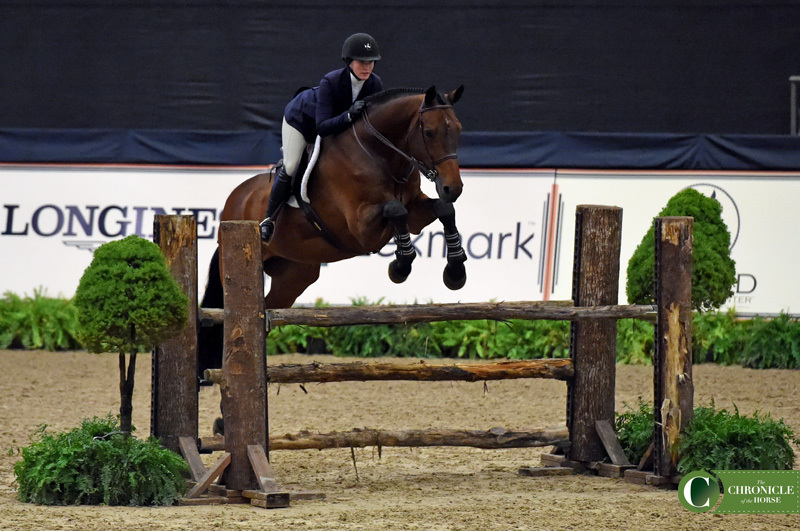 Gillian Aiken adds in the first line and has to really dig in to get her horse over the brush oxer. Juliette Joseph is nice and tidy in the first part of the course, clocks right around and finds everything. A good, solid round. Jessica Stone lays down a really solid trip, just finds everything out of stride and looks really polished out there. Lindsey Klein gets a little deep to fence one and gets the five stride line done a little late. Jumps through the second diagonal well and ends nicely. Sara Hearn is a little late getting the five as well, her horse is really jumping up well, the rest of their ride is nice and stylish. Emma Kurtz. Photo by Kimberly Loushin. 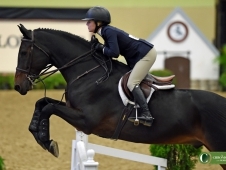 Emma Kurtz gets the first line done beautifully, she’s an accomplished hunter rider and it shows here, her round is super rhythmical and measured. I have to believe we’ll see her called back. 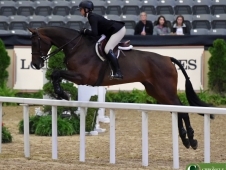 Elizabeth Nestor’s horse is a super cute jumper, goes well down the first line before spooking at something in the crowd and refusing to make the turn to the hedge oxer. She gets him over it the second time and they finish out the course well. Samantha Meyer’s horse looks a little backed off, she’s digging in and getting the job done, toward the end of the course she’s able to smooth it out a bit and trust him, they end well. Hannah Hoch’s horse is a super cute jumper, she does a good job getting him back when he makes a big effort at fence two. They have a great round, I would bet we’ll see them back later today. Caroline Ellis was having a really pretty round before her horse rather unexpectedly stopped at the one stride and she slipped off, landing on her feet. She rolled up her stirrups and gave him a pat on the way out of the ring. 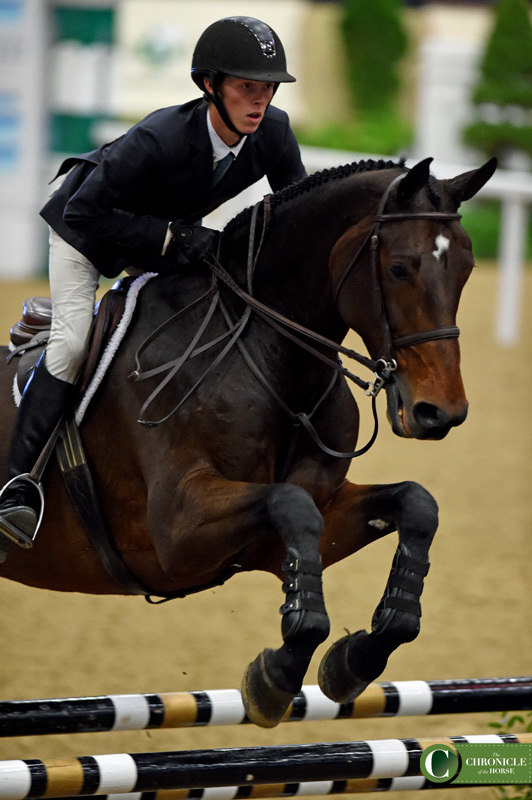 Ned Cuniffe got crooked in the first line but got away with it, his horse rather firmly objected to the brush oxer and cantered off away from it but they got over it on the second attempt. Mia Mannis is rider number 135 and our last to go before the third and final break in out first round. She gets down the first line well and stays with her horse as he makes a rather good effort at the brush oxer. 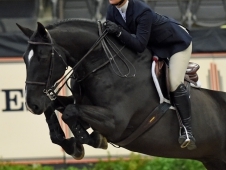 The horse has a great lofty jump and Mia rides him well, unfortunately they have an unexpected top in the one stride, and then a stop at the single white rail. Sam Walker, Emma Kurtz, Coco Fath, Paige Matthies, Daisy Farish, Catalina Peralta, Alexandra Worthington, Kaitlyn Lovingfoss, Ellie Ferrigno, Tanner Korotkin, Farah Rizvi, Jessica Stone, Emma Fletcher, Bay Noland-Armstrong, Ellie Yeager, Isabelle Song, Erika Jakobsen, Caroline Bald, Sophie Gochman, Ashley Vogel, Hannah Hoch, Annabel Revers, Alex Pielet, Brooke Morin. Vincent Desiderio is our first after the break, he gets a little quick around the course but overall a nice ride. Isabela De Sousa pulls the rail at fence three but otherwise has quite a lovely round. 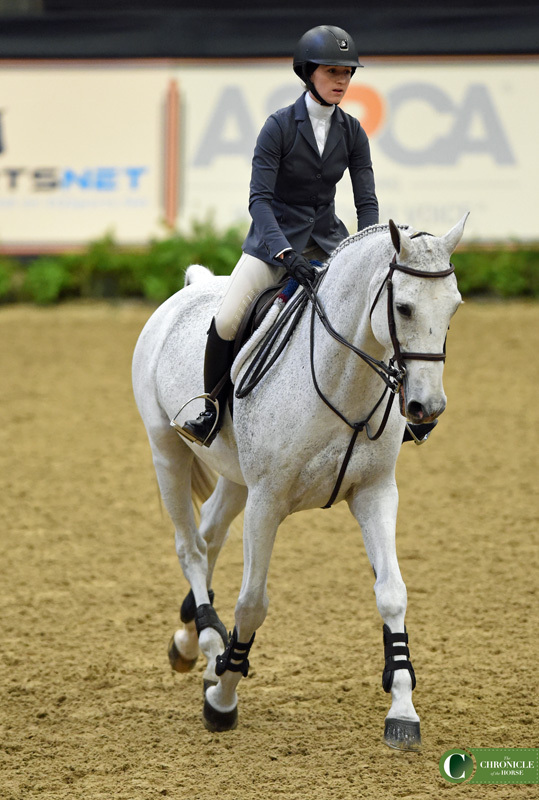 Sophia Gianoulis has a nice controlled round, her horse is a great jumper. Annalise Reed has a nice solid round, really gets the job done well. 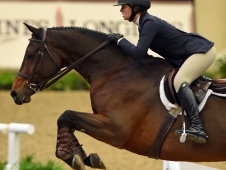 Mimi Gochman is in next on Kaskade, T.J. O’Mara’s former equitation champion. She has a great ride, you can probably add her name to the stand by list. Cayman Szegda in next, she pulls a rail at the third fence and at the vertical heading to the double but an very respectable ride. Kyla Sullivan has a stop at that pesky brush oxer, made it around the rest of the course just fine. 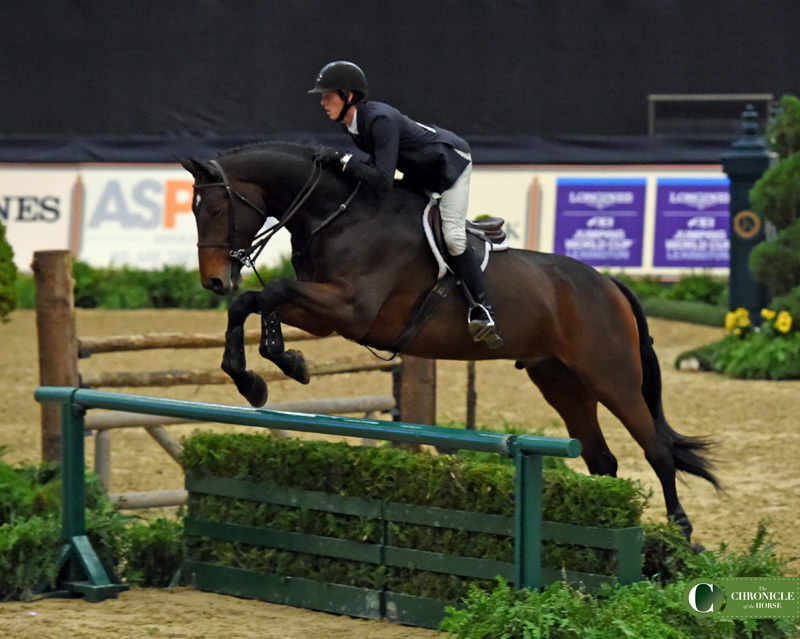 Camryn Halley pulls that third fence too, also has a rail at the vertical going to the double, still a solid ride. Marielle’s Fries got in the first line a little deep, had to really kick for four and really pull for the five and took the rail at the third fence. Found her way through the rest of the course just fine. Anneliese Kolaska has to really pull to fit the five in down the first line. 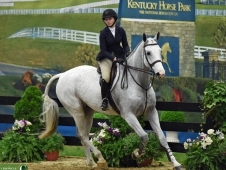 Her horse is quite a stylish jumper and they skip through the rest of the course without much of a problem. 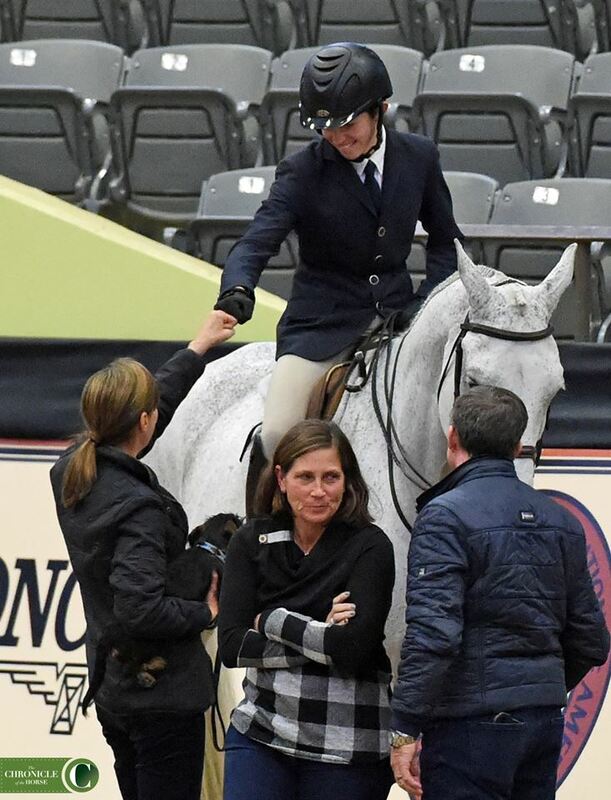 Portia Muenke’s horse rather aggressively objected to the first fence twice, an unfortunate thing to have happen at finals. Maura Lautenbach pulled the rail at fence two and at five. She gets through the rest of the course in a good workmanlike fashion. Miranda Seade pulled the rail at fence three and got a little deep to the brush oxer at four. Rachel McMullen also takes the rail down at three. Other wise it’s a very nice round so we’ll see if the judges hold it against her. 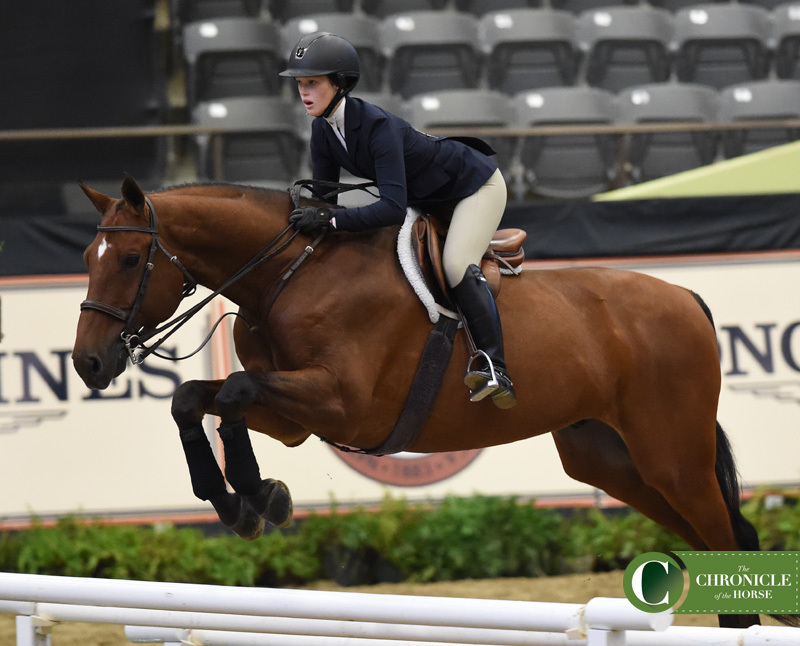 Grace McEneaney is in next- she gets a little lost and wiggly down the first line and her horse canters past the brush oxer at four. They have a second run out in the second diagonal line. Abbygale Funk has a bit of an awkward fence three but it stays up and she kicks on. They have the rail in the one stride as well. Rollin Sykes up next. She gets the first line done, she holds a bit too much early in the next line and has to kick on the way out but also gets it done. She finishes the round out well. Ava Ellis in next, she gets the job done quite well, I think we may see her called back. Olivia Brandon has a couple of slightly short, couple of slightly long distances but overall a very respectable ride. Ava Ellis. Photo by Kimberly Loushin. Charlotte Meyers hunts right around, a little gappy a few places but it works for her and her mount. 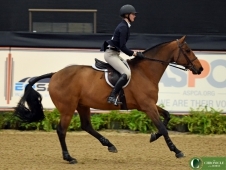 Carly Sweeney has a hard time getting her eager looking mount to fit in the five and he pulls the rail at three. They have a bit of a miscommunication at the final fence and have the rail down there as well. Hannah Rohrbach has the rail at fence five and is a bit gappy through the one stride but delivers a respectable ride. Devon Thomas had a really nice masterful ride, there is a chance we’ll see her back for the call back. Emma Pacyna had a swap off down the first line and a bit of a flyer out of the second line. 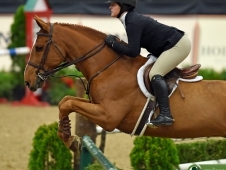 Her horse is a very stylish jumper! 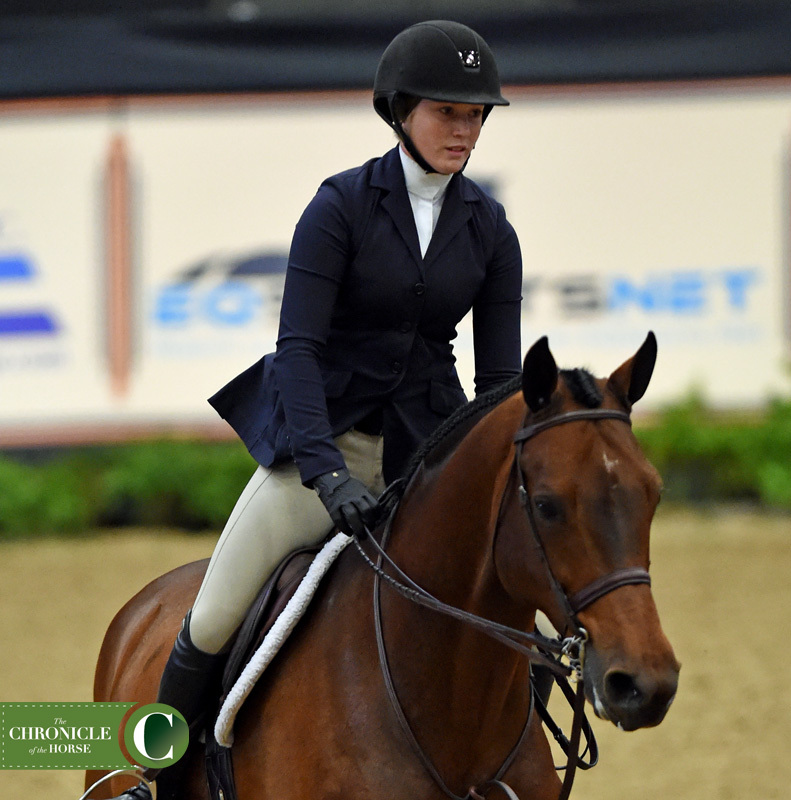 Eliza Kimball had a great round, really great rhythm, I think we may see her back later today. Amanda Traphagan had a solid, workmanlike round. Leanna Lazzari finds a couple of long spots but makes them work for her. Olivia Broder gets a little deep to fence five but has an otherwise nice round. Anna Bremermann gets a little forward toward the end of her round but gets the job done. Clea Caddell really has to work to fit the five strides in the first line but she gets it done. She pulls the rail at the vertical to the double but wraps up respectably. Isabella Bleu Baxter’s horse is an adorable flaxen chestnut, really cute jumper, they seem to have a great partnership and clock right around. Abigail Grace Kelley had a few hard rubs at some rails but otherwise made easy work of the course. Alexander Alston turned in a really solid performance, really a good ride. Sydney Hott in the ring next, she makes easy work of the first half of the course, finds her way nicely through the diagonal, has a couple sticky moments off the ground but makes them work for her. Devin Seek. Photo by Kimberly Loushin. Devin Seek gets a little quick coming out of some lines but makes it work for her, I think we might see her called back with that. Elizabeth Nevins has the rail down at fence three. Augusta Iwasaki gets the first line done really well but has a bad spook at the hedge jump. Mackenzie Suffy had a solid, respectable ride. Brian Moggre does a masterful job getting the first line done, he lays done a near foot perfect trip, you will for sure see him back later today. James Faloni gets a little crooked a couple places buts keeps it together to lay down a good trip. Brian Moggre. Photo by Kimberly Loushin.